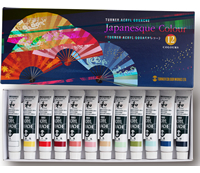 – Japanesque Colour Series – 69 colours. 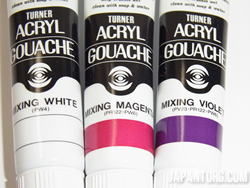 Turner Acryl Gouache is one of the highest quality range of paints available today. 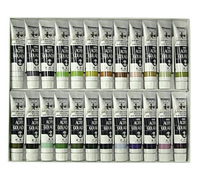 A professional quality matte acrylic gouache with a wide range of 219 colours. Ultra fine pigments means colours spread smoothly and cover wide areas uniformly. Quick drying and water mixable. No bleeding or streaking when over painted. Reliable adhesion to a wide variety of surfaces including paper, cloth, glass, plastic, stone, clay, acryl board, metal and wood. Superior spreading of colours thanks to ultra-fine pigments. You can paint wide areas uniformly without any defects, with no need to repaint. Dries quickly. Can be painted effectively and efficiently. You can paint quickly and wonderfully as you wish, and expand your creativity. Water-reducible, and good water-resistance after drying. You can paint multiple layers with no bleeding and no streaking. 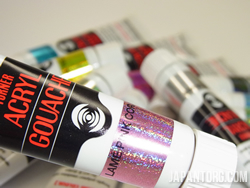 Opaque finish that will enhance beautiful coloring. Velvet finish will enhance your expression. Reliable adhesion to various materials beyond your expectation. Paper, cloth, glass, plastic, stone, clay, acryl board, metal and wood. 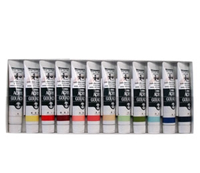 Full range of colour lineup consists of intermediate colours in addition to basic colours. 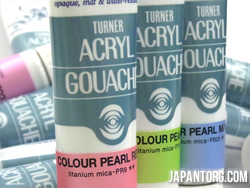 Color Pearl / Pearl / Metallic / Lame Colour series – “Shining” is added to those brilliant Acryl Gouache series. You can use it as you like to achieve what you desire. Use it as a point colour, then a contrastive, gorgeous, and even fantastic mood will be obtained. 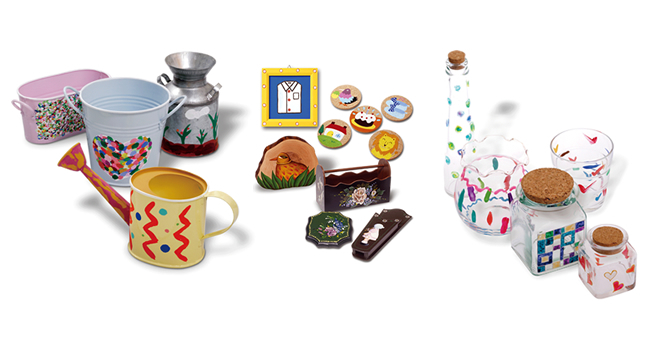 Also you can use it for one point decoration on your belongings or in other various scenes as well as on your paintings and illustrations. Fluorescent, Grayish, Pastel and Mixing – Fluorescent colours for brilliance, and Grayish pastel colours for subtle colour expression.You can use colours that are unrealizable by color mixing to achieve what you desire. 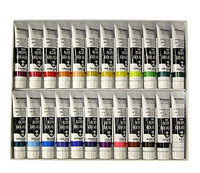 Mixing series helps colour mixing in subtle tone with keeping original brilliance. 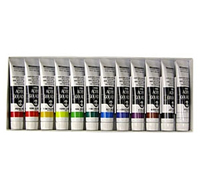 Original Colour Series include a full range of basic and intermediate opaque colours. 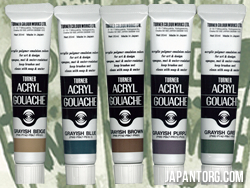 Traditional Japanesque Colours’ beautiful, sophisticated tones are formulated with fine powders which give a unique slightly textured matt finish. Colours of this series have splendid, refined, soft and warm luster like pearl. Colours of this series have unique pearly luster. * Opacity is lower compared with ordinary colours. 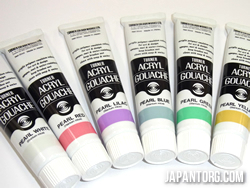 * These colours are very translucent, so may result in uneven finish. When painted on a white background, colours will vary depending on viewing angles. When painted on a black or dark background, colours may slightly change from original tones depending the color of background. This series can offer metallic colours with gorgeous glitter to represent a rhythmical expression. * Translucency may result in an uneven finish. 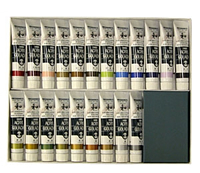 This series can offer the paints with Lame tones of which will vary depending on viewing angles.When painted on a black or dark background, colours may shine better. Knife or spatula is better than brush for a successful finish. Brilliant fluorescent colours. Using a black light will make them illuminate. You can achieve various grayish expressions as you like. Quiet tones that will not make your work too dark are offered. Clear and pure tones will express delicate and sensitive beauty. You can mix colours as you imagine. Containing no fluorescent pigments, Mixing series stay clear when mixed. White exclusively for mixing purpose. Translucent white pigment of Mixing White will make clear and pure colours when mixed with other colours. *Opacity is lower compared with White. As shown above, increasing Mixing White of about five times as much as White will make almost the same lightness of mixed colours. As Mixing White is easy to adjust the mixing amount, you can make mixed colours more precisely. Exclusively for mixing purpose. Containing no fluorescent pigments, it can be painted uniformly when mixed with other colours. 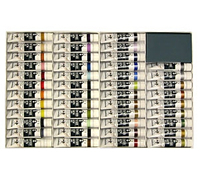 Mixed colours are permanent because of its lightfast quality. Violet and Magenta place their importance on brightness of colours. Although they are less lightfast, their colours are exceptionally vivid. Most suitable for mixing. Lamp Black can be painted uniformly, and makes neutral gray when mixed with White. 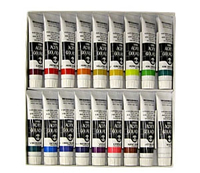 White, Jet Black, Permanent Lemon, Permanent Yellow Deep, Permanent Scarlet, Permanent Red, Burnt Sienna, Permanent Green Light, Permanent Green Middle, Sky Blue, Cobalt Blue (Hue), Violet. Dilute the paint with water in approximate ratio of 2:1 for uniform finish. For the airbrush application, add Gloss Varnish in the same amount or more to adjust colour tone and enhance adhesiveness. Any kind of brushes can be used. Any kind of pallets can be used EXCEPT wooden or plastic pallets because dry paint may adhere persistently on pallets of these kinds. Before painting, degrease the surface of ground, if any, with soapy water, etc. 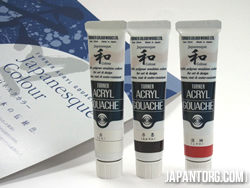 Acryl Gouache dries in 5 – 15 minutes and becomes water-resistant. Add Retarder if you want to slow drying time. Seal the wet paint on the pallet tightly with cooking wrap, etc. if your work is suspended. Use of Mixing series for color mixing will achieve more beautiful finish. Don’t mix with other types of paints. Clean your brush and pallet before the paint dries. If it dries up, dip the brush and pallet in water for hours or in AG Cleaner and clean them with soapy water after the paint softens. Good adhesiveness to various ground materials, flexibility, quick drying suitable for painting over, and water-resistance and durability suitable for outdoor usages. 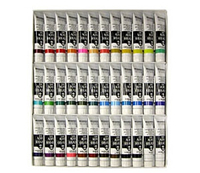 With these superb characteristics and rich 219 colours in Acryl Gouache, you only have to pursue your artistic mind. Papers of various appearances such as glossy or rough textures, and bulky quality. As papers are easy and inexpensive to handle, you can challenge whatever you wish. 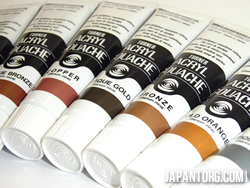 You can enjoy matte finish of Acryl Gouache on a sharp brightness of the metal. 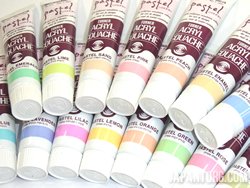 Matte finish of Acryl Gouache will enhance the quality of clay. You can keep the original colour of the clay by painting thinly, and obtain subtle nuance. As Acryl Gouache stays on wood very well, you can exploit full potential of wood’s shape and texture, and expand the image of your work. 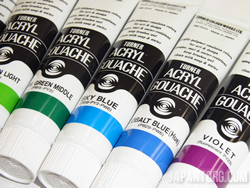 You can finish water-repellent materials such as acrylic boards or plastics by multiple layering of Acryl Gouache. You can add movement on your work by using surface texture and flexibility of cloth. 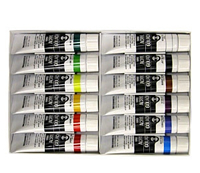 Since cloth is water-absorbent, you should paint as if putting Acryl Gouache gently on it. 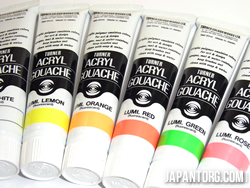 Brilliant colours of Acryl Gouache can be painted on stones smoothly. You can paint colours to utilize natural shape of the stone, or make patterns to enhance the expression on the stone. Tiny accentuation on your small articles will make them your original items. Can be painted on denims or leather, styrofoam, glass…, etc. Materials you want to paint on will be your canvases.